Welcome to my blog, sit down and stay awhile. My new friend @informedferret (actually that's two ferrets - James and Manny) had a pawty last night and it was sooooo cool. The theme was outlaws and gangsters with the hash tag #hideyhole. Some great theme music by the wonderful DJs and some terrific barktenders were dispensing the hooch and noms. The pawty was almost a disaster when some anipals who will remain nameless tried to use dynamite to get Georgetheduck out of jail. Almost blew George to smithereens. He survived a little singed. 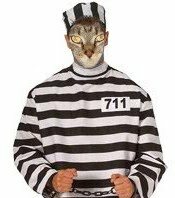 Here was my pawty outfit - cause I fought the law and the law one. Even though Indiana wants me and I was part of a Band on the Run, I was able to find a safe haven in Hernando's Hideaway #hideyhole. The pawty was to benefit the charity Heart of Ohio Ferret Association and Rescue Inc. It is not too late to donate! My pig brother Yoda did a post about our whole family so I won't bore you by repeating. But you can read it here. He didn't pick the most flattering picture of me that's for sure! 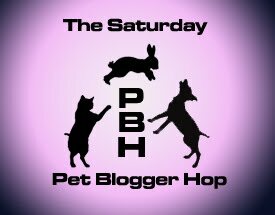 I am joining the blog hop again this week. Looking forward to finding more pals. Yoda and I read from the same blog roll so while I will try and follow everybody's blog too, please rest assured I am reading your posts too! Yoda may be a #pawpawty DJ but he is not the only music lover in the family. I am usually the one sitting on the back of dad's chair when he listens to music or plays his guitar, so I am quite knowledgeable about music. So, I have decided to feature a group I like every week on Mondays for Twitter Music Mondays. This week I am starting with my favorite of all times, bar none, groups - the guys from the Netherlands known as Golden Earring! This is a two for one video of Going to the Run and Twilight Zone, two of my favorites, although I have LOTS of favorites! You should really check them out. Radar Love is a good song, but this group is way more than that and they have been rocking for 39 years! I cannot believe I have not posted a blog since January! Shame on me! And you probably haven't seen me on Twitter either. Know why? Because that Brofur Yoda of mine hogs the computer and the best typist in the house. I love my daddy but he just isn't in to typing in the social media. So I begged and begged mom and downright guilted her out, and she is promising she will do better. But it could be worse, there are lots of other animals in this house with no Twitter account or blog. So at least I am one up on them! Yes, you heard me, I LOVE THE FREEZING COLD WEATHER. Before you think I'm nuts, look at it from my point of view. I am an indoor cat and mom and dad keep the house plenty comfortable no matter what the weather is. In fact, the only way I even know it's cold is I hear them complaining about it. I like it because my humans don't. That means they aren't going out very much. Take today for instance. Other than taking that dog Yoda outside a few times since he is too dumb to use a litter box, they have not stepped outside the house. So I could cuddle up behind daddy on the chair. He even furminated me today. I am a short haired tabby but that furminator sure feels good! Don't I look handsome after I was furminated? After mom nags dad enough about something called "mess" (I'm not really sure what that is) he will spend several days moving stuff around in our house and taking lots of bags outside. Not sure why he takes them outside but we never see them again. He has been doing this all week. But maybe I better explain. Mom and dad lived in a house of their own with us 4 kitties before that dog Yoda came to live with us. We did have a dog - Goliath. I had no problem with Goliath as he left us kitties alone - unlike Yoda! Anyway, mom's dad died so they moved in with her mother. 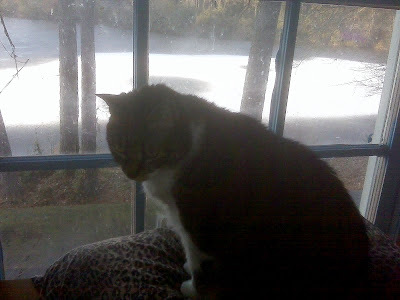 It is a big house on the water and there are lots of birds I can see from the window (I am strictly an indoor cat so I just look). It was a big house but already had lots of furniture. Mom and dad crammed as much as they could in their "apartment" which is two rooms made into one big one. They also had a storage unit for the rest of the home stuff like pots, pans and dishes and extra furniture. On Halloween mom said "enough is enough, $135 a month for six years is too much let's get rid of that stuff." She had a giant yard sale. Halloween is not a good day for yard sales. So she gave almost everything to charity. Except for maybe six boxes and some furniture she just couldn't part with. So I guess the mess was all the old storage boxes and just stuff that dad seems to make accumulate since he works from home. Here's the problem - dad kept taking away all of our favorite high places which made Sabrina, Majel and Cleo very unhappy since those are the places they feel safe from Yoda. There isn't much "under" to hide in either because Majel lived under the bed for a year when Yoda came so mom took the mattress off the frame. I'm okay because Yoda doesn't really scare me much and I am happy on the back of dad's chair - my regular spot. The other favorite place used to be on top of the TV but those darn humans went out and got one that didn't have a perch on it any more! But mom's daily email from Catster explained all about the fact we need high places to feel safe so dad is trying to help out. He stacked some plastic boxes so Sabrina is happier. Anyway, mom seems happier. Actually just him using that noisy thing on the rug made her happy. Oh I better explain about Goliath. He still lives with us sort of. Our apartment is upstairs and Goliath is old with arthritis and can't climb the stairs any more. So he stays downstairs with grandma and her dog Roscoe. Frankly, he didn't like Yoda much either. Yoda is just too frisky for us all. Mom and dad see Goliath but since us kitties live in the apartment we never see him. We hear him bark sometimes though. We don't like Roscoe either. This is my first blog post so it is fitting that I dedicate it to my favorite human and his very special Christmas present. I love my human mom too but dad is my favorite. One good thing mom did was order a very special Christmas present for dad. It has my picture on it! Dad loves it. 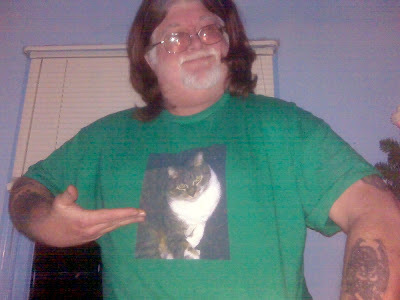 I enjoy sleeping on the back of his chair and occasionally looking at my picture on his shirt. I'm not sure what I am going to write about in the blog. After all, I never go anywhere and Yoda writes about all the fun family stuff. I'm open to suggestions from my pals. I am a tabby cat living in a house with my human mom and dad; my real sister cat Cleo; two adopted sister cats Majel and Sabrina; and the big, scary and needy @Yoda_the_Dog. Two dogs live downstairs with my grandma - Roscoe and Goliath. And heavens a new dog named Honey moved in next door.